You might think I’ve not been doing much sewing/knitting but I’ve been busy with additions to my wardrobe. The boiled wool came from Blackbird Fabrics in Vancouver. I bought the aubergine which I thought would make a warm addition to my wardrobe. A simple pattern with just two fronts, a back and sleeves which went together easily and because it’s boiled wool I didn’t need to finish edges! In fact there’s a dart at the bottom of the sleeve which is stitched by abutting the two edges and zigzagging it closed – doesn’t show but gives shape to the lower sleeve. 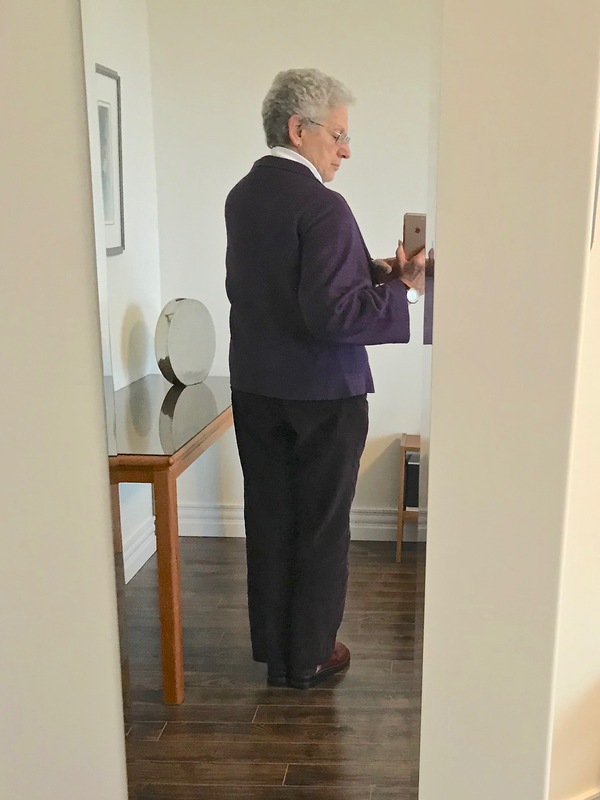 I’m still debating whether to do something similar in the middle of the back at the neckline – I’ve a slight rounding of my back at the neck and I think the jacket would fall better in the back were I to make that tweak. 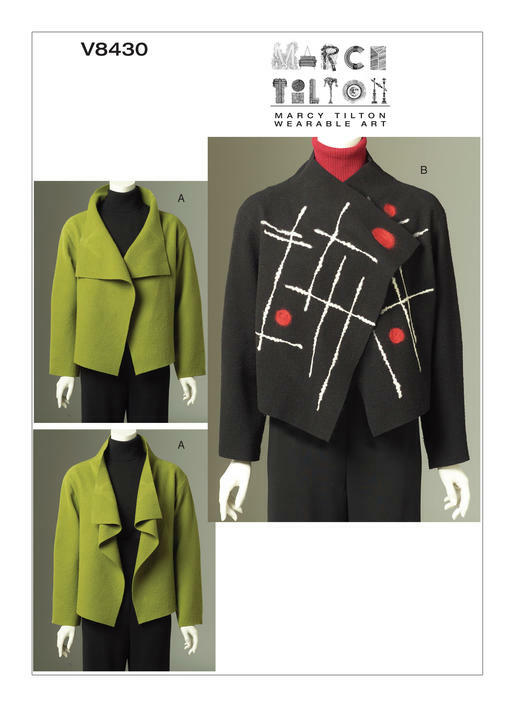 I chose the pattern because I thought the soft folds for the lapels wasn’t something I usually wear and would look “new”. 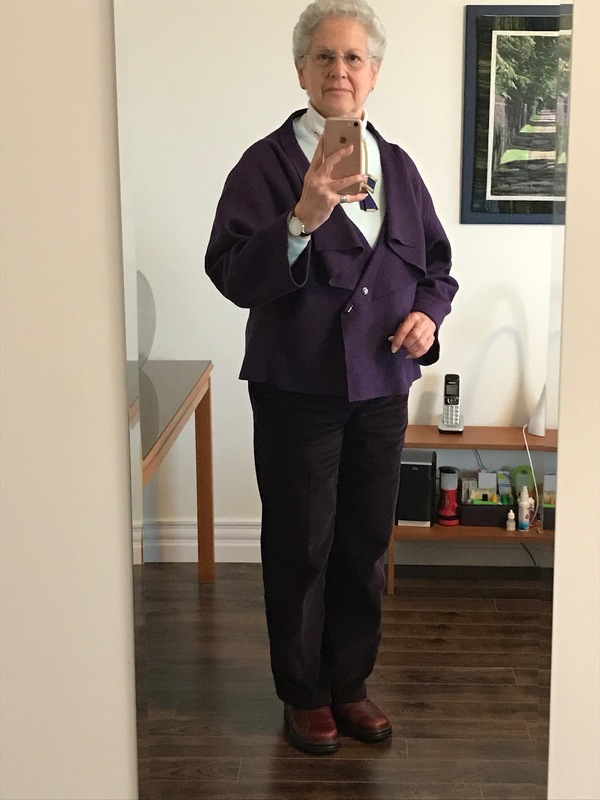 With a new jacket/sweater I thought dark purple cords a good choice – I whipped those up two days ago. Taking pictures myself is extremely difficult – to position the camera involves twisting which causes the pants to show a bit of pull. I had to take the side seams in after I’d finished them – I didn’t take them in as much as I possibly could because I was afraid I wouldn’t be able to sit. I’ll see how they are after I’ve washed them – the fabric was washed before I used it but it will shrink a bit more, I’m sure, with further washing. I have three more lengths of corduroy to make pants – I’m intending to get to at least one of those this weekend. OK. Not impossible. I took a deep breath and unstitched the waistband (which I’d put on upside down). Turned it around, stitched it back on. Added the waistband facing and stitched it down. 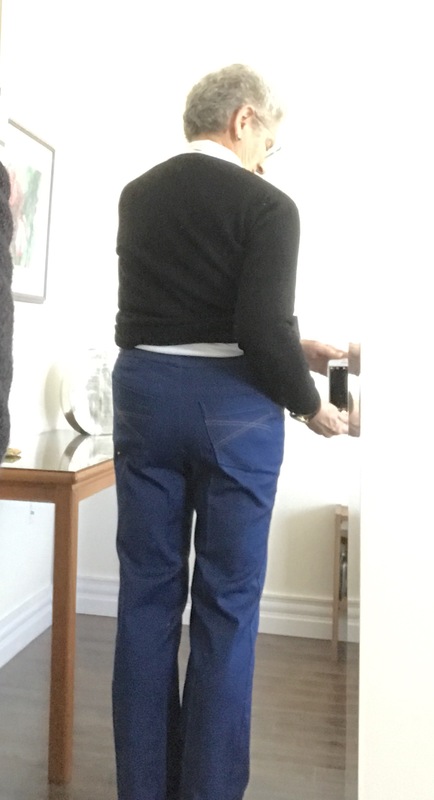 I did it, not to salvage the pants – there are problems with how the back of the legs is hanging (because of the fact that the side seams are out by 2″, right?). It’s the bum I was interested in and I can see it’s not bad (click on the images to see the fit more clearly). 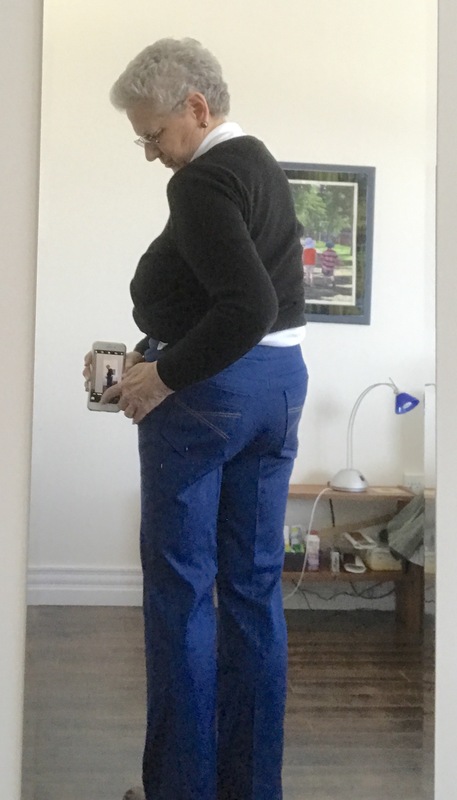 Had I done the construction correctly, the back would be fine – except for the pockets which are too low – for me, the pockets have to be almost on the yoke seam and not 2″ below which they are (which means I have to attach the yoke before putting the pockets on the back). If raised, the point of the pocket would be in a better location. the front waistline has to be dropped half an inch – with it that bit too long, the front crotch has “smiles” – which is something I definitely don’t want. (Part of the “smiles” is because I’ve been sitting in them while writing this – but I will shorten the front rise that 1/2″ in the next pair). Also I’m rethinking adding 1/4″ to each side seam – having had the pants on for 15 minutes I think the legs may actually be fine as they are (given the 20% stretch in the fabric). Other than that, the pants aren’t too bad. They have served well for a muslin. Nevertheless, they’re still going into the “send to Value Village” pile – but the NEXT pair will be PERFECT! Really. I have two cotton velour housecoats that I’ve had for close to 40 years. I haven’t replaced them because nobody has made much in velour for several years and because I couldn’t find a housecoat with a zipper front! Lots of fleece tie robes, but few that are long and with a front zipper. So I kept washing and rotating the two. Last week I was in Fabricville – I needed some 9″ zippers to whip up some small zippered bags using the fabric from Peru – when I came across some velour! It’s polyester and stretchy but I though it would make a decent housecoat so I bought enough for two – some in a deep teal, some in a pale teal. Here are the two finished housecoats! Just finished the pale one today. Tricky fabric to work with – hard to keep seams even because of the stretch. The velour is also problematic – can’t press it on the right side! The dark one which I did first had to be recut – I’d got about half way through when I realized the whole garment, but particularly the neck, was too big. I didn’t want to buy more fabric so I actually cut the seams out, downsized the front and back yokes, cut off the zipper and reassembled the pieces. Inserting side pockets was a challenge — not an easy thing to do using a serger. First I stitched the pocket pieces to fronts and back side seams with a straight stitch, then serged around the pocket, next I serged each side seam (being careful not to catch the front of the pocket in the serged seam. Hemming the garment was also a challenge – I probably should have used a cover stitch but I didn’t have serger thread anywhere close to the garment colour so I elected to hem using a twin needle. Because the fabric is so stretchy, getting it to feed evenly under the foot took a lot of care (I’d pressed the hem to the desired width before stitching – that helped). The second housecoat went together much more easily because I knew what I was doing. 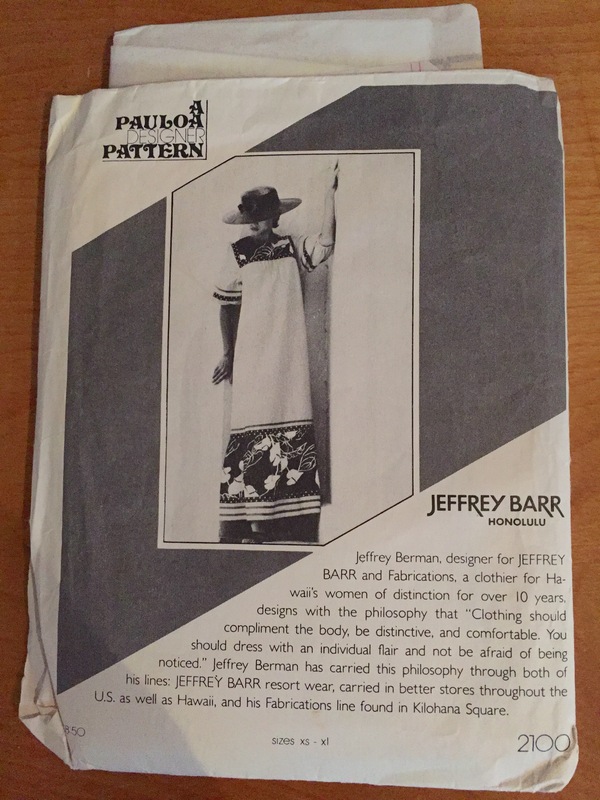 What I haven’t told you is my “pattern” is a very old Hawaiian muumuu pattern I’ve owned for years. I’ve made batiste embroidered nightgowns from it but had never adapted it for a heavy garment like these housecoats. Adapting it meant creating a front opening with an invisible zipper. I had no instruction sheet to direct me – I had to figure out a sewing order on my own. Like the front yokes had to be attached to the front skirts, the back yoke to the back skirt, the shoulders stitched together, the ribbed neck band sewn in place before I could tackle the invisible zipper! That’s because the zipper needed to come about half way up the ribbed neck band. I knew all of that when I started the second housecoat – I didn’t know it when I started sewing the first – lots of trial and error with that one. Good thing I’m a patient sewer – I had to take seams apart repeatedly until I got the garment assembled correctly. The two old housecoats are now in the laundry. Once they’re clean they’re off to Value Village – they still have some life left in them.